Contact lenses prescription is not as simple as spectacle prescription, to understand. The contact lenses need lot of sophistication, likely to adjust its power in order to place on the eye. In addition to the documentation of the actual fitting parameters, for higher precriptions deserves the moderate technology. The meaning of the Ocular dexter is the right eye and it can simply written as OD. The Ocular sinister denotes the left eye and it can be simple denoted by OS and these are the latin initials for the eyes respectively. The numbers that are followed to OD and Os are the power of the contact lens for the respective eyes. As we discussed earlier, most of the people can identify a lot of difference in the prescription of the contact lenses and the spectacles prescription. Also, very marginal difference between the right eye and the left eye. The power of the lenses is inversely proportional to the distance between the eye and the contact lenses or spectacles, inorder to cover the vertex distance. The case of inversely proportional exactly denotes that, as the power of the lenses become weaker as we move towards the eye viceversa, if we consider a particular case or a person. We, the contact lenses express, maintain a separate specilist for these kind of measurements, inorder to generate the prescription for any individual. The astimatism, with small amount, can be reduced to half way or corrected completely by the sperical equivalent contact lens. Even, the difference between the prescriptions of contact lenses and spectacles can be observed between the contact lens wearer with astimatism. The problem involved in using the spherical lens on behalf of rigid lens is, the capacity to hold the tears beneath the lens will correct the astimatism is comparitively less. The disposable soft lenses does not contain this extra facility. There is a steep imbalance between the soft lenses and the rigid lenses in the case of number of unique corneas they will fit into. 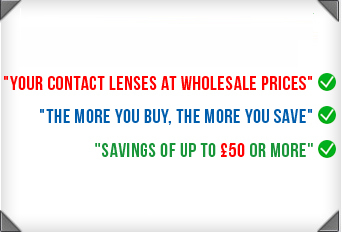 Therefore, we at contact lenses express prepare more number of rigid lenses than the soft lenses. Because, as explined earlier a unique size soft lenses can fit into more number of corneas.